Most days any salad I eat is dressed with balsamic. It's everybody's favorite. My ranch eating days were over when I turned 20. I'm just not into that gloppy, heavy feel on a salad. But every once in awhile I just love a good caesar salad. Dressed with homemade caesar dressing that is anything but gloppy and dull. It's think and bright and tangy. This dressing is all those things and it's delicious. 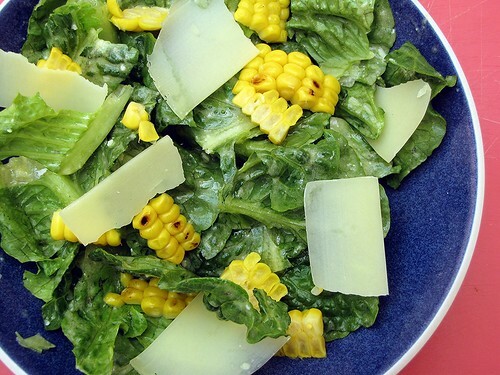 And adding corn to a classic caesar transforms it from side salad to main course lunch. Mmmh! I wish I was eating it again today! Preheat oven to 425 degrees F. Brush corn with olive oil and place on a baking sheet. Bake for 20-25 minutes, or until kernels are soft and golden. If you'd like them more charred, you can broil them for 1 to 2 minutes. While the corn is roasting, you can also add the bread cubes to a baking sheet and bake them for 8 to 10 minutes, or until they are golden. As soon as removing the croutons from the oven, drizzle them with the brown butter. Cut the corn from the cob. To make the dressing, add the garlic, yogurt, parmesan, mustard, vinegar, anchovies, lemon juice, salt and pepper to a food processor and blend until pureed. With the processor still on, stream in the olive oil until a creamy dressing forms. Add the lettuce and corn to a large bowl and sprinkle with salt and pepper. Toss with the dressing, then add the croutons and remaining cheese. Serve! I use the anchovy paste. It doesn't impart a fishy taste but adds a certain saltiness to the dressing.